* Highest quality Internal electronic voltage regulator. * Oversized bearings with high temp. grease for durability. Interchangeable with Mitsubishi brand alternators. * Custom machined 1.7" 6 groove Overdrive pulley for best performance at low rpm. 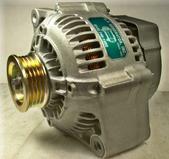 * Interchangeable with alternators equipped with rear mounted B+ terminals. * Interchangeable with 5 or 6 groove serpentine belts. Align belt along the inner groove of pulley. * Highest quality electronic internal voltage regulator. * Heavy duty rectifier plate with high amp diodes for durability. * Custom machined 1.9" 6 groove overdive pulley for best performance at low rpm.